The UniGear Hammock is a great hammock that we chose to review and really enjoyed. Check out the full review below and be sure to check out our Top 10 List. With your purchase of a Unigear Double Camping Hammock, you will receive 2 tree straps and 2 solid steel carabiners. In the past apparently not everything was included to hang your hammock with this company, but now everything is included. The Unigear Double Camping Hammock is made of a strong, compact and lightweight material. To be more specific this hammock is made of breathable 210T parachute nylon with triple interlocking stitching. Keep in mind that this type of material will not insulate you from the cold. This is not a drawback unless you were wanting a hammock that had thermal capabilities. Because the parachute material breaths, even the slightest cool night breeze will most likely make you cold. Make sure to pack a sleeping pad and warm sleeping bag for cold nights. This material on the other hand will be great for hot summer days and nights, when you want the breezes to cool you off. The super smooth material of the Unigear Double Camping Hammock will not make you sticky or sweaty. In fact you may enjoy the smoothness of this next to your skin. The straps are constructed from 1000D high density polyester webbing. Each strap can support 300 pounds with a combined weight of 600 pounds. The straps are each 3 meters long and have 16 loops per strap. This offers a total of 32 combined adjustment points which will allow you to wrap it around big trees or attach your hammock to roof racks or boat masts. Really, what ever is on hand and can hold your weight the straps should be able to attach to. Some people have safely even attached this hammock to their balcony posts. 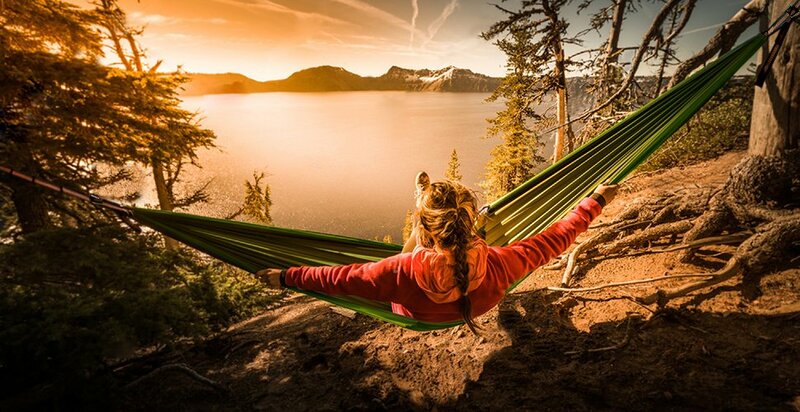 The Unigear Double Camping Hammock can support up to 500 pounds. This means that this will be great for two people or one, just so that the weight does not exceed the 500 pound limit. The size of this hammock measures 10 feet long and 7 feet wide. It is big enough for two adults or extra roomy for just one. Some people with small children like to try to fit their whole family in the Unigear Double Camping Hammock. Just so long as you don't exceed 500 pounds, you should be good to go. Sitting in the hammock with your feet out will fit in more people. If you are a couple and plan on sleeping in it, you might want to think again. Yes, it will hold you if don't exceed 500 pounds, but no, it will not be comfortable. Unless you like being squished up against someone for the night, you really should consider two hammocks for sleeping. If you are set in sleeping in this overnight together, people who have done so, say to sleep sideways not long ways. Have your feet coming out. Tall people especially liked this hammock. In reviews taller customers said that they purchased this hammock because they were tall and this hammock was longer than many of the other brands. They liked that it was long enough to lay at a 15 degree angle (There is lot to learn about the perfect hang) as opposed to having head, shoulders and feet way up in the air. Unigear offers 4 color choices for their double camping hammock. This is nice since some of the competitor double hammocks offer only 1 or 2 choices. If you choose this hammock, you can choose from dark blue and sky blue, fruit green and army green, olive green and army green or sky blue and gold. One frustrating thing for any outdoors person is when you buy a piece of camping equipment that seems great only to find that it fit your needs but only for a short time. This shouldn't be the case with the Unigear Double Hammock. 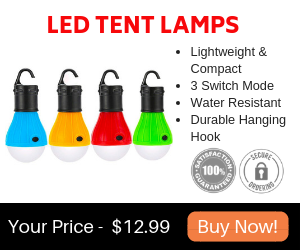 People that have purchased it years ago and have taken it on numerous overnight camping trips say that it has held up well. The triple stitching is a bonus. You shouldn't have to worry about anything coming apart at the seams. The material and straps are strong enough to go the distance and last over time. A hammock drawstring sack is sewn directly into the Unigear Double Camping Hammock. This is a nice feature that most of the double hammocks have. If you are someone who looses stuff easily, you won't have to worry at all with the sack being attached. When it's time to pack up and pack out, simply stuff your Unigear Double Camping Hammock into the sack and you are out of there. Another nice thing about the hammock sack is that you can put your cell phone in it while you hang. Also, vehicle keys and a snack could fit in there. You will be saving some money when you purchase the Unigear Double Camping Hammock as opposed to some better known double hammocks. But quality does not seem to be compromised with this hammock. 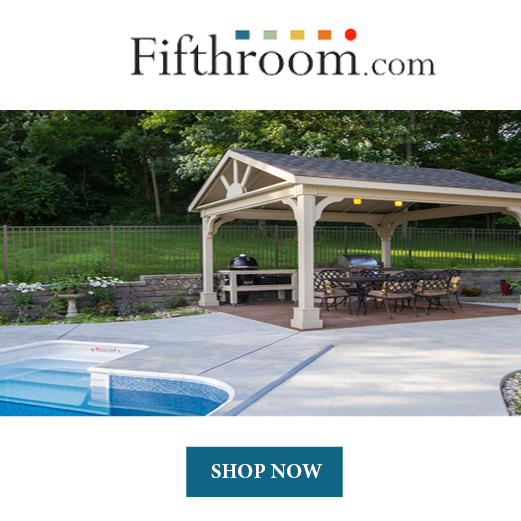 It simply is not one of the top sellers, so to gain your business they charge less. From reviewers who have tried both the expensive double hammocks and this hammock, they said the Unigear Double Hammock stacks up well. Sometimes you just are paying more for a name brand. The Unigear Double Camping Hammock is easy and fast to set up. Everything that you need to hang your hammock is included. Simply wrap the tree straps around the tree according to the directions. Then unfold the hammock form the stuff sack. Lastly, hang the hammock to the strap loop. It's 3 easy steps that even a beginner can accomplish with ease. Unigear wants their customers to be happy. They offer a 100% customer Satisfaction guarantee. The warranty is unlimited and no questions will be asked if you'd like to return your Unigear Double Camping Hammock. I recommend this hammock as a first time hammock hanger or an experienced camper. After completing a careful review of customers who purchased this hammock, most feel that you are just paying for a name, when buying higher priced hammocks from other companies. The only drawback I can see is that if a 500 pound load capacity is not going to be enough for you, especially with this being a double than you may want to go with another double hammock with a larger weight load capacity. With a money back guarantee and no questions asked, I don't think you can go wrong with the Unigear Double Camping Hammock. Here are some top questions that I found for people seriously considering buying a Unigear Double Camping Hammock. I've never owned a hammock. 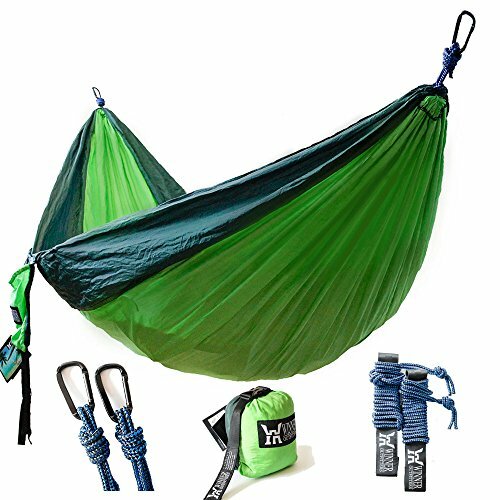 Would this hammock be for beginners? Yes. Even a complete novice can hang this hammock in less than 5 minutes. I want to use this on a week long trip. Will this hold up? Yes. The Unigear Double Camping Hammock will last for many years. Just read the reviews from many satisfied customers. Is this hammock easy to wash? Yes. Just machine wash cold or spot wash with a cool wet towel. With a money back guarantee you can't go wrong. I like when companies offer money back guarantees with no questions ask and am leery about companies that don't offer this. So no worries there. As far as quality, customers who purchased the Unigear Double Camping Hammock were very satisfied and returned to buy more hammocks.